The application “After” is so amusing that everyone can be attracted by this wonderful application. 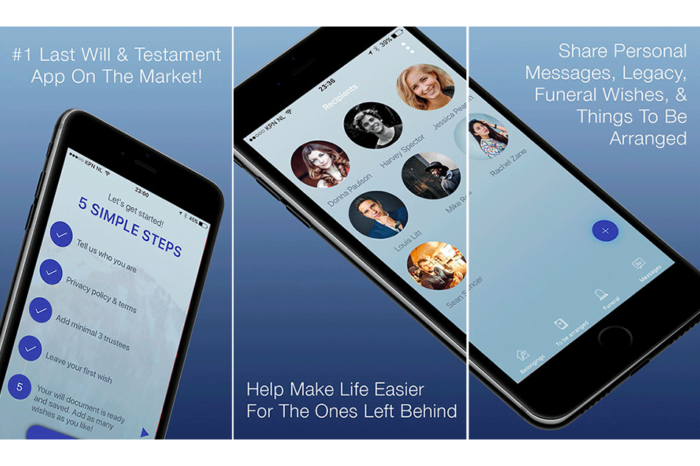 This application allows you to tell your last wishes to your friends and family members with no big worries. “After” application helps the left ones to live their life happily by transferring them your last wishes. the world. This application is so amazing. It provides a simple user friendly interface and everyone can easily use it. Using this application you can create your last wishes and change them when ever you want. With “After” a digital time capsule can also be created by saving photos, videos and texts. Your information is completely secure with After and only transferred to the other person when it will be the right specified time. You just make sure that your last wish is transferred to those who are more important and close to you. It is the number one last wish application in the market. You can easily send your personal messages, videos, and photos to others. It provides the most important information to the relatives such as insurances and pension funds. You can easily share your feelings and insights with your friends and family members. You can also leave your last wish for the arrangement of the funeral. It is a completely secure application. People of every age can use it easily. Step No.1: First of all download the application and set up your account. Step No.2: In second step select the person you want to send you last wish. Step No.3: In this step you should fill all your last wishes with photos, videos or texts. Step No.4: Share your last wishes or Insights with others at the specified time. The “After” application is so awesome because it can give you freshness when you feel bored and when you feel lonely. It also helps you to make happy when you share your last wishes with love ones. People of all ages can use this application and can show their love and importance to their friends and family members. If you want to change your last wish or any message for your relatives, you can also do it without any big deal. You can also send your last message or wish using photos or videos. People of all ages can easily use it because it is very user friendly application. This application is becoming more and more popular and currently it is the best and number one last will application in the market. your last wish is transferred to your friends or relatives at the specified time. you just need to select the right person whom you want to send your feelings or wishes. Your all data is completely secure with the “After” application, you do not need to worry about your important data.